But a substantial minority, whether worried they will lose their jobs if safety violations close mines or eager to curry favor with bosses and executives by "running coal" even in unsafe conditions, tolerate unnecessary hazards in the mines. I wonder where coal miners would ever get the idea that their jobs would be at stake if they reported safety violations?
. 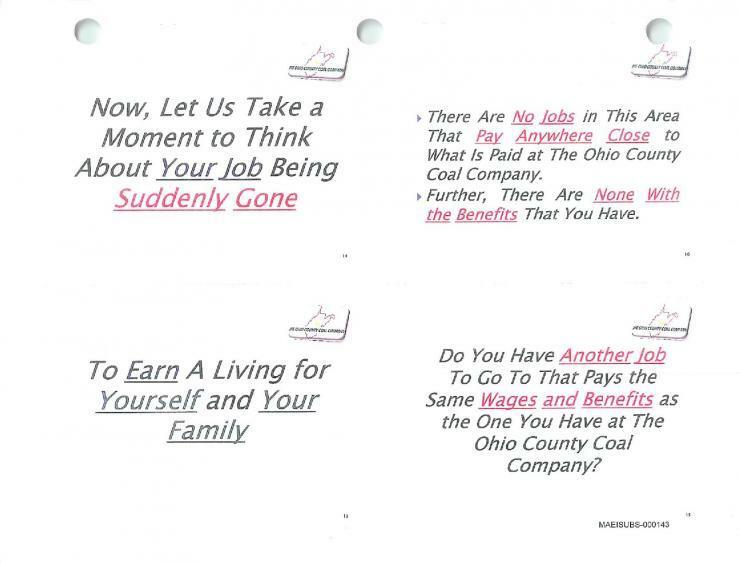 . . the case stems from instructions that CEO Murray gave to 3,500 workers in a series of mandatory meetings at five northern West Virginia mines in 2014. The speeches were accompanied by PowerPoint slides that said disgruntled workers were lodging too many confidential safety complaints -- known as 103(g) reports. Again, where would miners get the idea that their jobs were threatened if they reported safety violations? Of course the locals ignored this in their coverage of the original suit and in their later (5 days later, to be precise) pro-Murray Energy article when they eventually got around to covering the decision. And in this editorial, both management and the workers are to blame. Blankenship is blamed by many for the 2010 explosion that killed 29 men at the firm's Upper Big Branch Mine. And as a federal court jury in Charleston decided last week, he did conspire to violate government safety rules. But he had been charged with three offenses. He was convicted of just one, a misdemeanor. That was despite the fact testimony in his trial indicated a large number of rule violations at the mines he oversaw. The editorial is about mine safety and since Blankenship was found guilty on only the first of the three counts against him (a misdemeanor offense), the editorial appears to be suggesting that the jury did not fully blame him for the safety conditions which lead to the miners' deaths. However, counts two and three (of which he was found innocent) had nothing to do with mine safety; those charges dealt with making false statements and securities fraud. So on the only count that dealt with miner safety, Blankenship was found guilty by the jury. That said, I probably shouldn't be too hard on this editorial writer -- he or she probably depended upon the Intelligencer's and News-Register's coverage of the trial which ran the gamut from non-existent to sketchy.